IceCool. Asus is trying to appeal to the mainstream with its new K53SV multimedia notebook. The 15 inch device should impress with its Intel Core i5-2410M dual-core processor, as well as the GeForce GT 540M graphics card from Nvidia. In addition to this the neat case also contains a Blu-ray drive. The Taiwanese manufacturer ASUS already confirmed a refresh of the K-series at the CES in Los Angeles at the beginning of the year. This series is aimed at customers who are looking for a mainstream model notebook with good all-round characteristics. Along with our tested model there is also the 17 inch K73SV, and there are also the model variants K73SV -TY032V, as well as the K73SV -TY053V available. In addition to this our tested model is also available in two different versions. The K53SV-SX126V and the K53SV-SX131V versions are differentiated by two components. Instead of the 8x DVD Super Multi D/L drive in the K53SV-SX126V, our tested model has a 4x Blu-ray Combo drive. Other than this our tested model also has a 640 GByte hard drive, instead of the 500 GB HDD which is included with the K53SV-SX126V. Technically our tested K53SV-SX131V slots into the multimedia mid-range. At its heart lies the dual-core processor Intel Core i5 2410M, which reaches a clock speed of up to 2.9 GHz with Turbo-Boost. The graphics card is an Nvidia GeForce GT 540M. 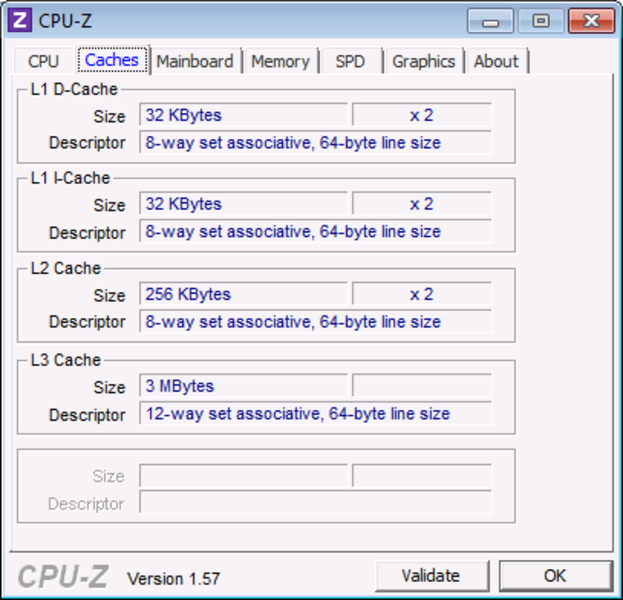 In addition to this there are 4096 MB of DDR3-RAM (1333 MHz). The Blu-ray drive is intended to make the K53SV a full-fledged multimedia notebook, with which it is also possible to play games from time to time. Whether or not this notebook is really suitable for this purpose can be discovered in the following review. The K53SV has an elegant metallic design with high quality materials. The surface of the mainstream model is composed of aluminum. The lid is embellished with a pattern, which provides for improved grip and makes it insensitive to scratches. The area around the palm resting area is also not very prone to scratching, since this is composed of a brushed aluminum material. Fingerprints are almost invisible on the surface around the palm resting area. The base plate in contrast is composed of plastic. The base plate itself is made up of a single large plate, which provides for access to the inside. 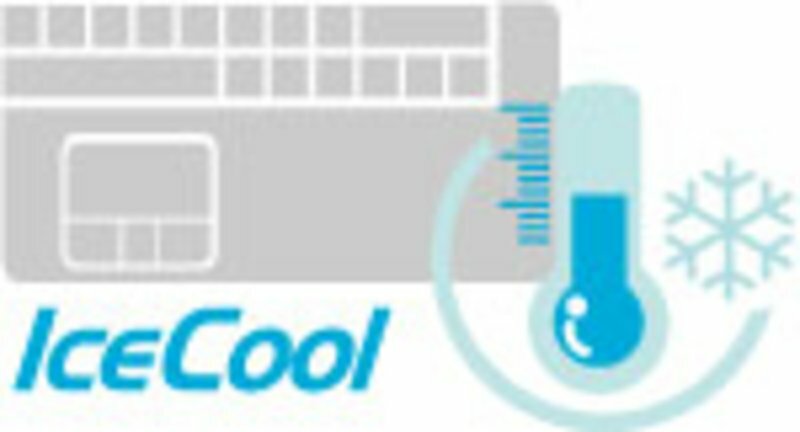 The K53SV was designed according to the IceCool technology. This is responsible for the cool palm resting area. The components, which release a lot of heat, were positioned in such a way that the heat is able to dissipate. The case of our tested device is very stable. The surface can only be dented marginally. Even the area around the optical drive, which is often the biggest weak spot as far as stability is concerned, can withstand localized pressure. This is valid for the bottom as well as the top of the notebook. Additionally the case is also not bendable. The display lid in comparison can be dented considerably in the middle, which is within limits though. The hinges hold the display firmly in place. When adjusting the opening angle the display only wobbles a small amount. The notebook itself stays completely still on the desktop, which is amongst other things due to the considerable weight of 2.7 kilograms. Altogether the manufacturing quality leaves a high quality impression. Interfaces are provided by the Asus K53SV on the left and right sides. At the front is a card reader, and at the back there are no interfaces. A muddle of cables next to the laptop seems to be unavoidable due to the location of the ports, if many external devices are used. Altogether the model only offers three USB 2.0 ports. There are no eSATA or more up to date USB 3.0 ports available. In order to enjoy watching HD movies on an external monitor, there are a VGA output as well as an HDMI interface available. The possibilities to connect to a network or to communicate with other devices are more on the sparse side. The Realtek PCIe GBE Family Controller (Gigabyte LAN) makes it possible to connect a LAN cable, while wireless LAN is made possible by the Atheros AR9285 Wireless Network Adapter (bgn). Bluetooth or a UMTS module are unfortunately missing completely. At the very least Bluetooth would have been a real advantage in this device category. When it comes to the included accessories the Taiwanese manufacturer has made some savings. Along with the notebook and the AC adapter, there is merely some printed documents such as the handbook in the box. Asus provides a 24 month warranty with pickup & return (battery 1 year) for this model in the K-series. The extension of the warranty to 36 months is possible for an additional 80 Euros. The warranty extension has to be activated within the first 90 days though. The chiclet keyboard has a complete alpha-numeric keypad. The somewhat smaller keys have a generous distance between them, but are a little slippery. To make up for this the pressure point is nicely crisp though. The keys have a rather hard end stop, and a medium key travel. Frequent typers should be able to get used to the included chiclet keyboard over time. 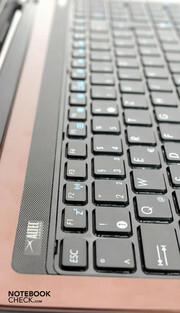 The touchpad is below the space bar, and is ideally suited to the design of the notebook. The PalmProof technology is supposed to interpret unintended contact with the sensitive surface as accidental, and does not process this. The cursor is therefore only supposed to move when a finger operates the touchpad. The PalmProof technology was also able to prove itself in practice, and there were no empty promises. Nevertheless, vertical and horizontal scroll bars are missing. The two mouse buttons unfortunately only have a very short key travel. The 15.6 inch display has a model description of CPT14C7. The HD panel has a maximum resolution of 1366 x 768 pixels. Higher resolutions are possible with an external display. The panel has a 16:9 aspect ratio, and has a reflective surface. The contrast of the glare-type display lies at a mere 181:1, and thus makes it into the average range of comparable devices at the best of times. 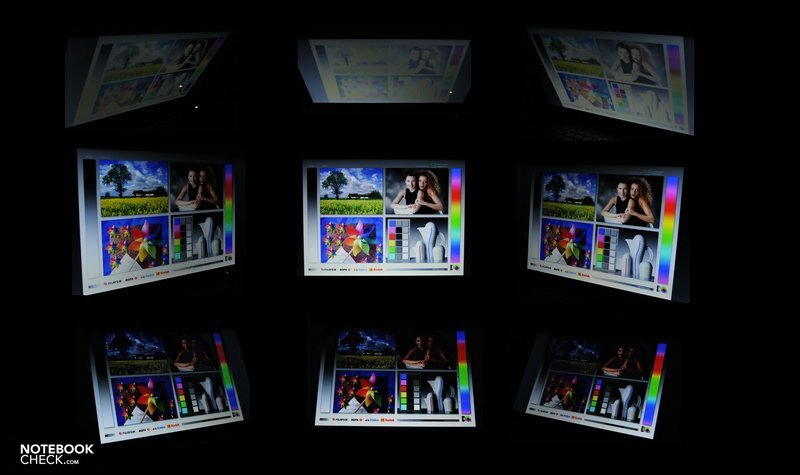 The LED backlit display has an average brightness of 200 cd/m². In some places on the panel we measured a maximum value of 215 cd/m² with the Gossen Mavo-Monitor. The illumination is relatively even with 83 percent. Is the Asus K53SV equipped for outdoor use with its 15.6 inch display? The answer to this question is rather on the disillusioning side: Within limits. Those that want to use the K53SV outdoors in the open, will at the very least have to find a place in the shade. Under direct sunlight users will see themselves on the display more than anything else. The viewing angle stability doesn't live up to expectations either. The photographs (below) show the problems clearly. Even small deviations from the ideal location lead to strong discolorations of the images. At the heart of the Asus K53SV is Intel's Core i5 2410M dual-core processor. 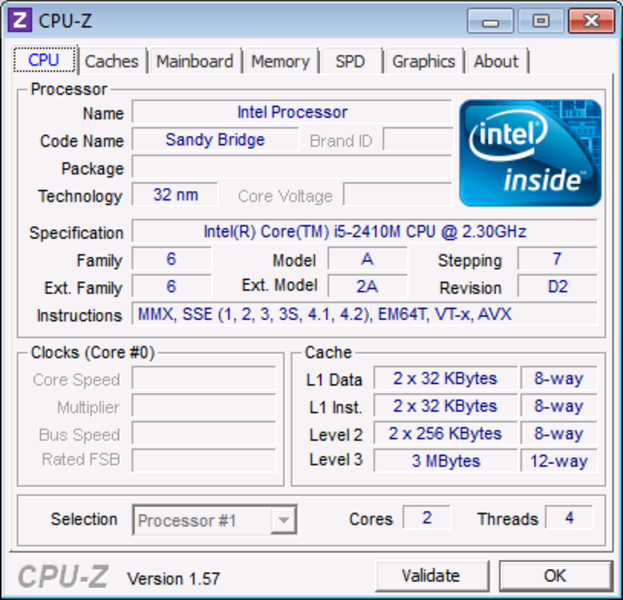 The Sandy Bridge CPU has a basic clock speed of 2.3 GHz, and can increase this to 2.9 GHz with Turbo-Boost. Integrated into the 64-bit processor with a TDP of 35 Watts is also the graphic chip HD Graphics 3000. For more demanding graphics performance there is also a graphics card from Nvidia included though. 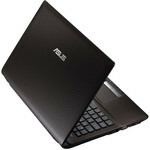 In this case the Asus has an Nvidia GeForce GT 540M, which is activated when needed thanks to Optimus. The RAM is composed of 4096 MB of DDR3-RAM (1333 MHz), and the Western Digital hard drive has about 640 GBytes of storage capacity with 5400 revolutions per minute. Considering these features, we are dealing with a classic multimedia configuration, which provides for a broad spectrum of application areas from office to gaming, and from the replay of content to its creation. How the performance measures up in detail is discussed in the following text. As long as the Asus K53SV can use both of its cores in multi-mode during the Cinebench R10 (32-bit) benchmark, then the system manages to score 7979 points with its Intel CPU. Intel's Intel Core i7-720QM quad-core processor managed significantly more points in the Lenovo IdeaPad Y560 (8359). When it comes to applications that are intended for several cores the quad-core processor has a significant advantage thanks to its additional two cores compared to the Intel Core i5 2410M. With Cinebench R11 the CPU is in the same area as other notebooks with the Intel Core i5 2410M with 2.5 points. 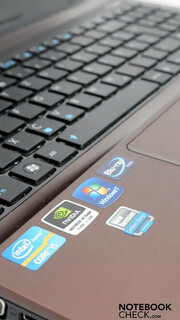 Altogether the notebook with its Intel dual-core Core i5 2410M can be found in the upper mid-range of our test database. With PCMark Vantage as well as the new Benchmark-Tool PCMark 7 from Futuremark, we tested the application performance of the K53SV. In PCMark Vantage the score of 6043 points was enough to nudge into the mid-range of our test database, surrounded by comparable configurations. With the latest release of PCMark 7 the Asus notebook falls back a little though. In this case the test database doesn't contain many entries yet however. As usual we proceeded to test the graphics performance with the aid of the benchmark series 3DMark. 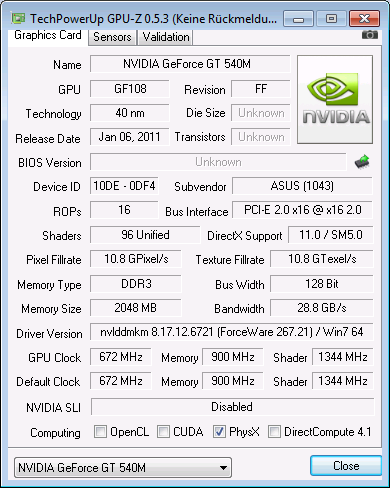 In this case the Nvidia GeForce GT 540M scored the typical results for this graphics card. With 3DMark Vantage the tested device managed to score 4170 points in total. The Schenker XMG A501 (W150HRM) notebook only managed a significantly better result (5357) with an Nvidia GeForce GT 555M using the same processor. The Asus K53SV nevertheless lingers amongst the upper third of devices in our test database. The gaming suitability was additionally tested by us using current games with different settings. The included hard drive from Western Digital provides an ample capacity of 640 GBytes. The model WD6400BPVT-80HXZT1 has a rotational speed of 5400 rpm. We tested the performance of the hard drive with HD Tune 2.55 and CrystalDiskMark 3. The 2.5 inch HDD nudges into the mid-range of our test database. The average transfer rate lies at 63.6 MB/s. Slow access times of 20.2 milliseconds don't speak in favor of the hard drive either, since there are several faster models available on the market. Following the theoretical performance tests with 3DMark we also tested the performance using five current games. The popular football game Fifa 11 is not excessively demanding, and can be played smoothly with 71 frames per second using the maximum detail settings. When it comes to Call of Duty Black Ops, Dirt 3, and Mafia 2, this already reaches a critical level with a high detail setting using the native resolution (1366x768). In this case there are occasional glitches from time to time. Battlefield Bad Company 2 only reached 26 fps with high detail settings, whereby the fun of playing the game is lost. 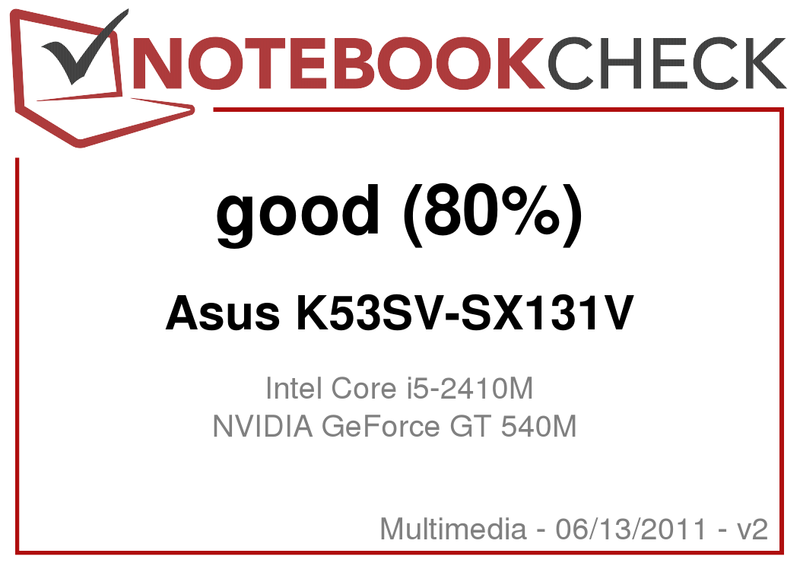 Compared to other notebooks with an identical configuration, the Asus K53SV falls behind and ranks towards the bottom of our test database, far from the leaders (e.g. Asus K73SV 2410M/GT540M - 32 fps). In the Mafia 2 benchmark test the notebook can however get to the top of the list in the benchmark comparison. During the course of our benchmark tests, particularly with more demanding games such as BF:BC2, a very inconsistent series of results were observed when carrying out the same benchmarks more than once. This could be an indication of thermal throttling. The Asus K53SV doesn't make itself very noticeably as a result of its system noise. In an idle state we measured a mere 30.3 dB(A) from a distance of 15 cm. Also when playing back a DVD the notebook stays inconspicuous with 35 dB. Only when subjected to a high load, such as during the stress test with Prime95 and Furmark, does the Asus model make itself heard, but is still by no means disturbing with 40.3 dB. As already mentioned the Asus K53SV makes use of the IceCool technology. This is supposed to keep the surfaces, and particularly the palm resting area, cool at all times. In an idle state the case does indeed stay relatively cool on the top surface with an average of 25.2 degrees Celsius, as well as the bottom surface with an average of 25.1 degrees Celsius. The consequence of the higher performance is an increased heat dissipation. Using a stress test we tested an increased heat dissipation as a result of higher performance demands. In this case the Asus notebook still stays relatively cool around the palm resting area though, and we didn't measure more than 30.6 degrees Celsius. On average the top surface heats up to 32.4 degrees Celsius, while the average temperature on the bottom surface lies at 31 degrees Celsius. In some places the K53SV surface temperature rises to a maximum of 38.4 degrees Celsius when subjected to the maximum load. To sum up we can say that the Asus is on the right way with its IceCool technology. Following a stress test using Prime95 and Furmark for in excess of one hour we took another closer look at the performance of the Asus K53SV. While it didn't come to any significant limitations during the subsequent 3DMark 2006 benchmark, the Cinebench benchmark showed considerably reduced scores, in other words there was noticeable throttling. 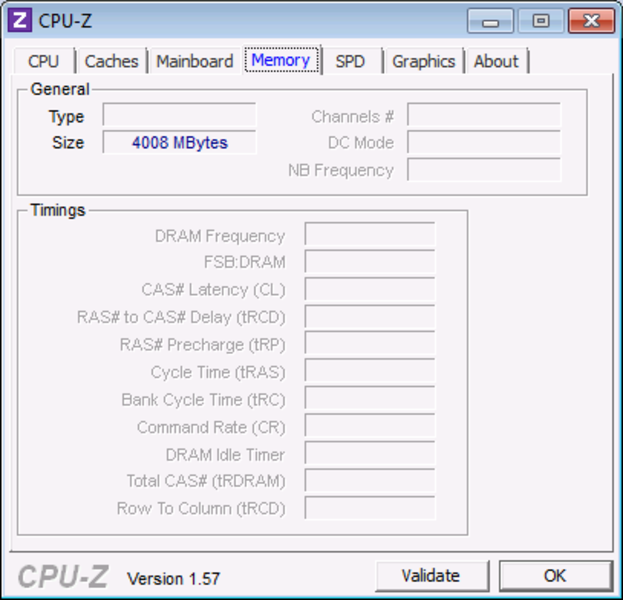 During the stress test the processor clock speed reduced to 650 MHz. In the case of Battlefield Bad Company 2, which is also known for its particularly high CPU demands, this could also lead to problems during the game as a result of the CPU throttling. The apparently inconsistent benchmark with high graphics demands also point in this direction. Asus has equipped its multimedia notebook with two stereo speakers made by Altec Lansing. The audio quality is subjectively reasonably good, but not exactly astonishing. The low as well as the high frequencies could be more clearly defined. A subwoofer would also be an added advantage, although the maximum volume is more than enough. External speakers can only be connected to the headphone output or via HDMI. Asus has provided a 6 cell battery with 5200 mAh of capacity for the mobile use of the 15 inch notebook. In an idle state the Asus K53SV managed 5 hours and 17 minutes with the Battery Eater Readers test (min. display brightness, WLAN disabled). Under load the notebook managed 1 hour and 24 minutes with the Classic test from Battery Eater. In practical office use (WLAN surfing) the K53SV stayed powered for 4 hours and 16 minutes. When playing back a DVD the notebook managed to stay on its feet for 3 hours and 29 minutes with the maximum brightness. With these results the Asus is ranked among the upper mid-range multimedia notebook competitors. The observed power consumption was confirmed by the measured battery life. Merely 12 Watts is required by the K53SV in the Quiet Office Mode. Under load the power consumption rises, but this varied considerably during the stress test with Prime95 and Furmark, between 60.5 Watts and 91.6 Watts. This is a further indication for throttling. As long as the system only had to contend with Furmark, the requirements of the system were 66.7 Watts. The Asus K53SV multimedia notebook in its SX131V version left a mixed impression. For a price of around 800 Euros buyers receive a useful device, which does have its weaknesses though. What was able to impress us was the stable case made of aluminum. The palm resting area never gets too warm thanks to the IceCool technology. The system noise is also a positive aspect. What dulls the good impression is the reflective display with a meager brightness, and narrow viewing angles. Interfaces such as USB 3.0 and an ExpressCard slot are both missed with the Asus K53SV. Bluetooth would also be favorable for the notebook, but is absent in the K53SV. The performance of the mainstream model with an Intel Core i5 2410M 2.3 GHz, as well as an Nvidia GeForce GT 540M, appears to be sufficient for most application scenarios. Unfortunately we were able to notice a considerable throttling in high load situations as well as with demanding games. For normal users this will unlikely have any significant impact though, gaming aficionados be warned. Equipped with a Blu-ray drive there are no obstacles to the pleasure of high resolution movies, with the exception of the included HD display panel. Despite several drawbacks the Asus K53SV could definitely be interesting for some users. The IceCool technology lived up to expectations in our test. The stereo speakers are made by the manufacturer Altec Lansing. For outdoor use the display is only suitable in the shade. The manufacturing quality of the multimedia notebook is good. The card reader in the K53SV is missing a dummy. One year warranty is provided for the 6 cell 5200 mAh battery by Asus. Only a single plate provides access to all the important components. Power-4-Gear is of course available with this Asus model. Especially the stable case of the Asus K53SV was able to impress us. A USB 3.0 port and Bluetooth would be advantageous for the K53SV. Otherwise the ports could also be better distributed. How cool the IceCool technology kept the area around the palm resting area under maximum load.